Hello everyone, my name is Ganesh living in Bangalore. Though we receive many media files on social media apps everyday, one video I got on Whatsapp related to a paralysed Gymnast made me feel his pain. I could not resist myself discussing this with few of my colleagues and since I am an existing donor on Milaap, we decided to take this matter on Milaap and help this Gymnast. This national level Gymnast from Mysore, India started gymnastics at 9 and everything went well until October, 2010 when he landed on neck while performing summer sault. The small amount he gets from government is not enough even for his medicines. We personally visited him and seen his struggle even for routine activities. Kind hearted people, I request you to donate for this cause and with the hope of getting cured of his spinal non-movement, he may lead his routine life without depending on anyone. Ray of hope: Two years back, a news story was published in a state newspaper and Chandraprabha, an Ayurvedic therapist, approached Anantha Rao and suggested him for Ayurvedic treatment. She has been treating him since then, every week. Ananth is now married to Chandraprabha and a ray of hope is seen in his life now. “He couldn’t even sit before, but now he can sit in the wheel chair for 4 hours. I can see improvement in his condition. If he is provided with proper Ayurvedic treatment, he can even start to walk,” says Chandraprabha. It is estimated that the treatment expenses may go up to around Rs 2.5 lakh as the treatment costs Rs 3,000 per day. 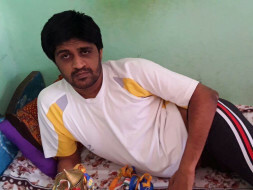 Thank you all for your kind donations, Anantha Rao is doing well and training for para olympics. Please keep praying for him. Happy to inform that he is doing well and started practicing para olympics in the wheelchair itself. He will continue to take stem cell injections for further improvement. Thank you for the support that you have shown towards my treatment. I am doing better now compared to earlier. I have taken 4 stem cells injection's so far and the response has been really good. I am able to move around a bit. Based on these results the doctors have advised me to take the stem cells injection in my hand as the fingers are very still. 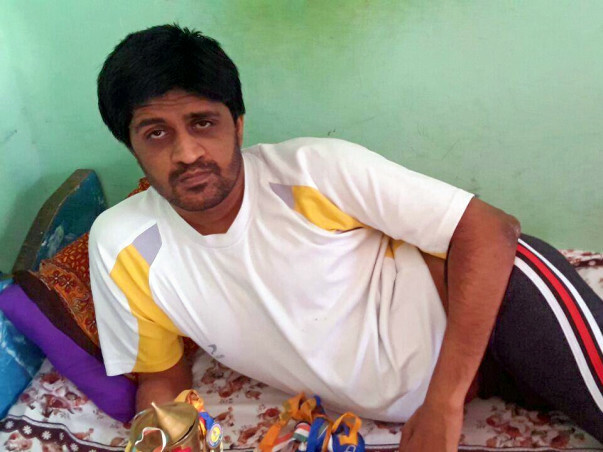 Additionally, I am undergoing physiotherapy and ayurvedic treatment at home as well. I would like to thank all of you for the wonderful support. Your support and blessings have enabled me to get the best treatment possible and recover faster.